The third and final title in The Wolf Chronicles: Kaala the young wolf fulfills her destiny—to either help humans and wolves to live in peace, or bring war that will destroy them all. Fourteen thousand years ago in southern Europe, a wolf cub named Kaala discovers that she alone can link wolves and humans, thus keeping humans from growing distant from and destroying the world around them. In Promise of the Wolves and Secrets of the Wolves, Kaala came to understand her role. Born of a forbidden, mixed blood litter, and alone after her mother’s exile, Kaala struggled to earn her place in the Swift River pack. 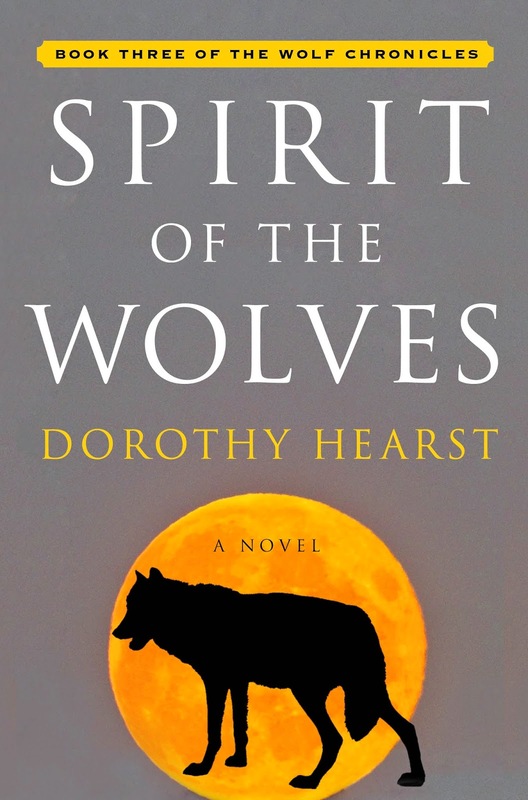 When she saved the life of a human girl, she put her hard-won place in the pack at risk, and responsibility for keeping peace between wolf and humankind fell to her. So far, she has failed. Now, in Spirit of the Wolves, Kaala has one last chance. She leaves her home in the Wide Valley with her packmates, the human girl she loves, and an obnoxious raven. Together, they travel to the land outside the valley, only to discover that new challenges await them. Kaala’s mother has no answers, a faction of ruthless Greatwolves will stop at nothing to maintain control, odd little wolves seek to take Kaala’s place, and, in the mysterious village of Kaar, humans are undergoing a transformation that could destroy everything she is working for. Only by calling on all of her strength and on the bonds of love with her human, raven, and wolf companions can Kaala hope to succeed. But it might not be enough. In this satisfying conclusion to The Wolf Chronicles, Kaala will have to fight and sacrifice in ways she never imagined, and she must decide how far she is willing to go for peace…when every step she takes leads wolfkind and humankind toward war. Stories and myths played an important role in The Wolf Chronicles from the moment I started writing. I used three primary mythologies as a foundation for the books: the Norse legend of Fimbulwinter for the three-year winter that led to the promise at the center of the trilogy; European folklore for the Little Red Riding echoes that run through the books; and Native American tradition for the trickster raven. But it was the wolves’ own legends, and the tales and lies told to Kaala, that drove much of the story and my own writing process. Kaala’s story in The Wolf Chronicles begins with her place in the world being defined by legend. “The legends say,” she tells us, “that when the blood of the Wide Valley wolves mingles with the blood of wolves outside the valley, the wolf who bears that blood will stand forever between two worlds. It is said that such a wolf holds the power to destroy not only her pack, but all of wolfkind.” That wolf, of course, is Kaala, and stories and legends influence her path throughout the trilogy. As she grows up, Kaala finds that not all of the legends—or those who tell them—can be trusted. Stories used to control: Early in Promise of the Wolves, Kaala is told an important part of wolf lore: that any wolf who associates with humans is abnormal. When she saves the life of the human girl TaLi, she begins to question everything she’s heard about the strange, two-legged creatures. Eventually, she learns that this particular bit of lore was put in place as a way to control the wolves of the Wide Valley. As her love for humans leads her to defy those in authority, she learns that legends and stories have great power, for better or for worse. Stories used to other or diminish: Throughout The Wolf Chronicles, as in the news today, some humans use lies about wolves to encourage others to kill them, which gets Kaala into several tense situations. In addition, those among the wolves who want Kaala to fail tell the story that she is the wolf born to destroy wolfkind. That particular story follows her throughout the book, and she often believes it herself. Stories used to empower and effect change: TaLi’s grandmother is a keeper of stories. There is also a spirit wolf who mentors and inspires Kaala with different legends than the ones Kaala hears from her pack and from the Greatwolves who rule wolfkind. These stories give Kaala the strength to do what she thinks is right, and to start seeking new stories. In the end, Kaala finds she must choose which stories about wolves, humans, and herself she will choose to live by, and this becomes a key part of her path in The Wolf Chronicles. Giveaway time! Simon & Schuster is pleased to offer a complete set of the Wolf Chronicles--PROMISE OF THE WOLVES, SECRETS OF THE WOLVES, AND SPIRIT OF THE WOLVES to one lucky winner! U.S. addresses only.